My earliest memory of my mother is when I was 3 or so, we had a large orange tree in the backyard of our home, it was Spring. The orange blossoms scattered the ground, and I stepped on one. My toe swelled with redness, and I began to cry, which is when my mother found me. She looked at the bee sting on my toe and swiftly headed back into the house. She re-emerged with a jar of honey, and drenched my toe in its sweet, sticky bond that smelled like lemongrass and chamomile. By nightfall my toe was healed, which is when my mother gave me my first lesson in natural remedies: The bee may have struck me with the poison of her sting, but on her pollen-dusted wings she also carried the antidote. This introduction to eco-harmony sparked my fascination with the study of plants, ecology, and of our human impact on natural life. My mother’s tutelage continued throughout my childhood, as I grew up assisting her in her apothecary. I watched as my mother blended her herbal synergies, and would help her to dry the botanicals from our garden for her formulas. Now grown, I am honored to work along side my mother, adding my own experience and knowledge to the herbalism that I grew up with. As a certified sommelier (wine scholar), I've made quite the study of soil, you see. Combining my mother's wisdom with my training in terroir (sense of place) has allowed me to cultivate rich soils with unique benefits to our botanicals- providing key mineral compounds for vibrant potency and nourishment. 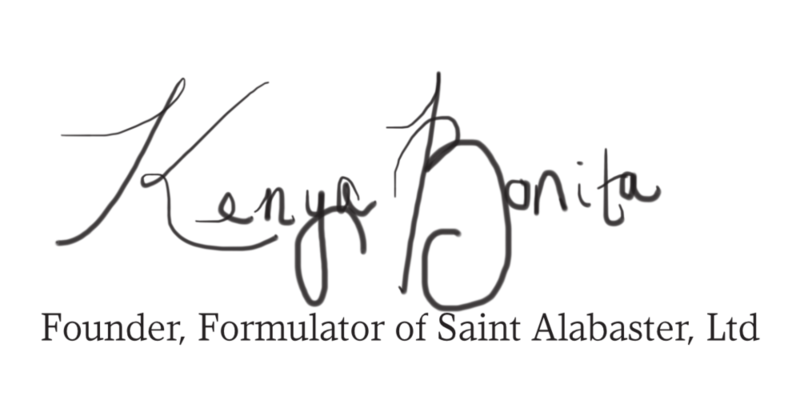 Every Saint Alabaster formula has been designed to target common skin issues by utilizing abundant, renewable resources - without toxic ingredients, fillers, fuss, or elaborate packaging. Ever. One may still find my mother and I picking herbs or hunting for white sage in the mountains together, always with a jar of honey in tow.